Bacon. Onion. Potatoes. What a seriously delicious combination. I was looking for something hearty to make for dinner during these cold winter nights, and nothing sounded better than a combination of bacon, onion, and potatoes. Twice baked. Mouth watering. Cut the potato in half, length wise. Bake on a cookie sheet at 375 degrees for 45-60 minutes, until tender. While the potato is cooking, saute the bacon and onion bits in a saute pan until browned. When the potato is tender, scoop out the inside with a spoon… to leave just a hollow skin. Put insides into a bowl. Combine the sauteed bacon and onion with the potato insides. Stir to combine. 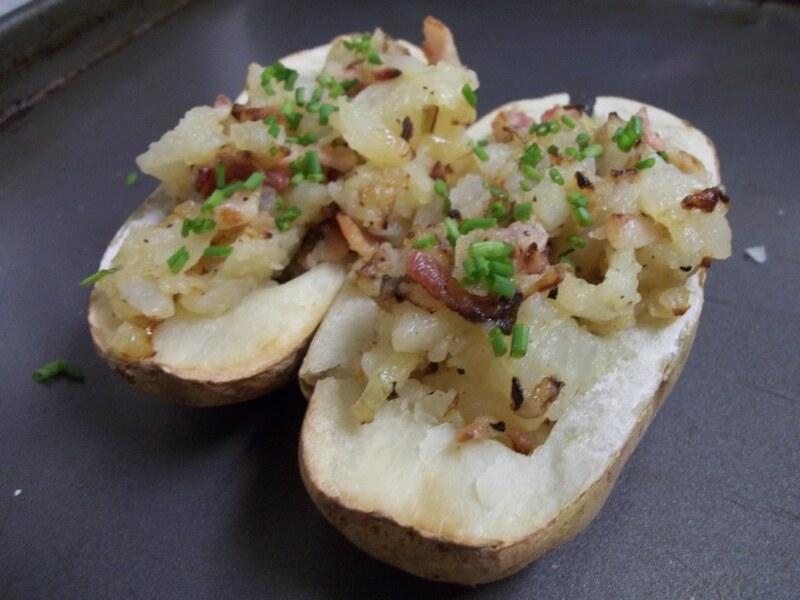 Scoop the bacon, onion, and potato mixture back into the hollowed out potatoes. Bake at 375 degrees for 5 minutes.